In May of 1999, I sign up for training to become certified for scuba diving, after several years of wanting to learn scuba. I am not expecting the level of training and fatigue that go into scuba certification. It involves several days of classroom study, 2 read-throughs of a scuba instruction book, and several exhausting pool and open water sessions. I nearly choke to death several times during the pool session, because I am unable to master the proper procedure for "mask clearing," in which a flooded mask must be cleared underwater. As a result, I inhale a large quantity of water through my nose. It is not until I am home later that week to practice the skill in a friend's pool (after being told I could not be certified if I could not master the skill) that I learn how to do it well. I am feeling down because I have problems with other skills, and feel like I am the worst student in my class. I am so depressed and scared that I am convinced that I would have to take the class again, or that I would drown during the open water session on the final week. The final weekend of open water training makes it all worth it, however. Despite feeling tremendous stress and anxiety on Saturday morning, I have an incredible experience at Rainbow River--one of the most colorful rivers in Florida. The spring-fed river gives several striking shades of blue, and the white sands and green grass beds add to the array of colors. After practicing skills, we engage in long drift swims along the river-both skin diving with our snorkels, and scuba diving. Both of these drifts are pleasant since they feature water with a visibility of approximately 100 feet, and a diverse, large collection of fish, including large bass, shad, perch, bluegill, and gar. At one point, our instructor picks up a baby snapping turtle, which snaps at the girls in our group when he puts the turtle in their faces. The scuba drift is quite relaxing. It is, by far, my longest underwater experience, and I enjoy it tremendously. It is wonderful to drift seemingly weightlessly in the very pretty river for 45 minutes without having to surface. Sunday, however, is even more of a treat. 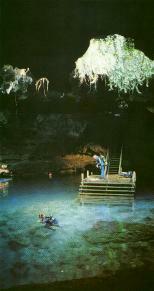 We visit Devil's Den, just outside of Williston, Florida. For several years, I have wanted to visit this extremely unusual geologic formation. As you can see in the photo, the Den is a prehistoric underground spring INSIDE a dry cave. The remains of several extinct animal species (saber-toothed tigers, giant sloths, and mastodons) dating back 2 million years into the Pleistocene Era have been discovered inside the Den. Early humans, dating back 7,500 years, have also been found in the Den. Entry is by way of a long wooden staircase, that is carved through a limerock formation at the surface. Descending 60 feet down to a wooden, floating platform, you find yourself in a large underground room that is lit up with sunlight streaming through a surface chimney and draped with long vines. The large limestone cave walls are completely vertical as they rise to the ceiling and chimney approximately 30 feet from the surface of the Den pool. The pool contains clear blue water that ranges up to 50 feet deep. The pool contains several large, black catfish. We watch them swarm our instructor as he feeds them fish food. Our training consists of two 30-minute sessions in which we gently swim in a large circle around the Den pool. Because much of the water is not reached by sunlight, we need to carry flashlights. The scuba experience here is fabulous. I feel as if I am floating in outer space, or on the lunar surface, as I drift-with "neutral buoyancy"-over the limerock formations on the bottom. The fossil beds at the bottom of the Den are 33 million years old. At 50 feet, I am at the deepest I have ever dove with scuba gear, being a new student. Scary at first, not being sure if I would be able to avoid the panic of failed air supply, getting caught in something, or suffering from the many other scuba risks, such as the bends, air embolisms, or mask squeeze. But compared to my erratic swimming pool experience the week before, both Rainbow River and Devil's Den scuba are surprisingly relaxing and enjoyable. Now that I am certified, I am now exceptionally excited about going on exotic scuba diving trips to Belize, Antigua, West Palm Beach, Sarasota, the Great Barrier Reef, the Florida Keys, and the many crystal-clear springs in my backyard here in North Florida. I recommend scuba to anyone who seeks the peak experiences that human life can provide. I would rank it with skydiving as one of the most spectacular adventures in my life. Scuba diving has opened up a whole new, exciting world for me that I would have never experienced had I not become certified. The company that certified me in Gainesville was Water World.